Remington shavers are legendary for their ability to provide a quick, close shave. SP4 Shaver Saver spray cleaner helps keep your razor running at top speed. Specially formulated lubricant protects blades from premature wear, as well as reducing friction and cleaning blade surfaces. 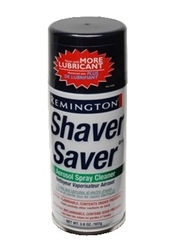 This Remington formula works great for all shavers, trimmers and clippers. Use SP-4 shaver cleaner each time you shave to maximize shaving performance. Remington SP4 Shaver Saver for use with the following shaver models: 5646 5647 5649 5BF1 5MF1 6MF1 8975 8985 8986 8987 8990 8991 8995 8MF1 9BF2 DA-107 DA-307 DA-307BLK DA-325 DA-407 DA-57 DA-757 DA-767 DDA-57 DF-10 DF-20 DF-30 DF-300 DF-40 DF-5 DF-55 DF-56 DF-57 ES-1000 F4790G F5790 F710 F720 GTX-1000 GTX-2000 GTX-300 GTX-3000 GTX-700 GTX-800 GTX-900 HGX-1 M-2180 M-22810 M-2810 M-2811 M-2820 M-2822 M-2825 M-2830 M-7830 M-822 M-8221 MS-2270 MS-2370 MS-280 MS-290 MS-5100 MS-5200 MS-5500 MS-5700 MS-6963 MS-700 MS-900 MS2-090 MS2-100 MS2-200 MS2-2100 MS2-250 MS2-260 MS2-270 MS2-280 MS2-290 MS2-300 MS2-370 MS2-390 MS2-400 MS2-400BB MS2-90 MS2100 MS2200 MS2270 MS2300 MS2370 MS2400 MS290 MS3-0004 MS3-1000 MS3-1700 MS3-2000 MS3-2700 MS3-3000 MS3-3500 MS3-3700 MS3-4000 MS3-4500 MS3-4700 MS34700 PM-950 R-1000 R-200 R-225 R-3130 R-400 R-4100 R-4130 R-425 R-450 R-460 R-5130 R-600 R-6130 R-650 R-7130 R-745 R-800 R-825 R-830 R-835 R-842 R-845 R-850 R-856 R-860 R-870 R-872 R-875 R-890 R-8943 R-9100 R-9170 R-9190 R-9200 R-9250 R-9270 R-9300 R-9350 R-9370 R-9400 R-9470 R-950 R-9500 R-960 R-TCT R450 R650 R800 R845 R890 R900 R950 RR-35 RR-41 RR-42 RR-45 RR-45DT RR-50 RR-50DT RR-55 RR-55DT RS-4263 RS-440 RS-4400 RS-4623 RS-4843 RS-4863 RS-6720 RS-6721 RS-6930 RS-6943 RS-6963 RS-7830 RS4400 RS4623 RS4843 RS4863 SF-2 SF-3 SF-4 TA-3050 TA-3070 TA-4570 TA-5570 TA-5571 TA4570 TF-100 TF-200 TF-300 TF-400 TF-500 TF-600 TF-700 TF600 WDF-1500 WER-4200 WR-5000 WRR-8000 XLR-1000 XLR-2000 XLR-300 XLR-3000 XLR-700 XLR-800 XLR-810 XLR-900 XLR-9000 XLR-9200 XLR-930 XLR-9500 XLR-9600 XLR-9800.